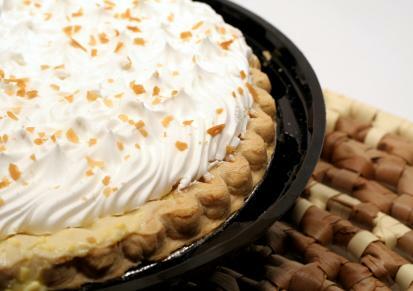 Coconut cream pie recipe is a no-bake delight that is the perfect way to end any meal. The cream pie is a traditional American dessert. In Europe, the cream of desserts are filled with crème patisserie, but this version of the coconut cream pie recipe is actually a variation on crème patisserie. Because the cream filling is cooked before filling the pie, you don't have to cook this pie. Instead, you just need to fill the crust and let it set in your refrigerator. You will need to blind bake the pie crust before you adding your coconut cream filling. The best way to blind bake your pie crust is to place a sheet of plastic wrap over your piecrust. Fill the piecrust with beans and then close the wrap. Bake the pie at 425 degrees Fahrenheit for ten minutes. Remove the beans and bake the piecrust for another ten minutes until it is golden brown. Once your piecrust is golden brown, take it out of your oven and let it cool. Then fill it with your coconut cream. In a heavy saucepan, heat the milk and the first 2 ounces of sugar. Bring just to a boil and then remove from the heat. Whip the egg and yolks in a bowl. Sift the corn starch and the second 2 ounces of sugar. Slowly add the sugar/starch mixture into the eggs while whisking. Temper the milk into the eggs. Return the mixture to the heat and bring it to a boil while stirring it constantly. When the mixture comes to a boil and thickens, remove from the heat. Stir in the butter and the vanilla. Mix until the butter is completely incorporated. Pour into a prebaked pie shell. Cool and then chill in the refrigerator. Once the pie is set, top with Chantilly crème if desired. You can add additional toasted coconut on top of the Chantilly.